French Fifties bejeweled gold brooch bird of paradise with plique ajour enamel: Description by Adin Antique Jewelry. 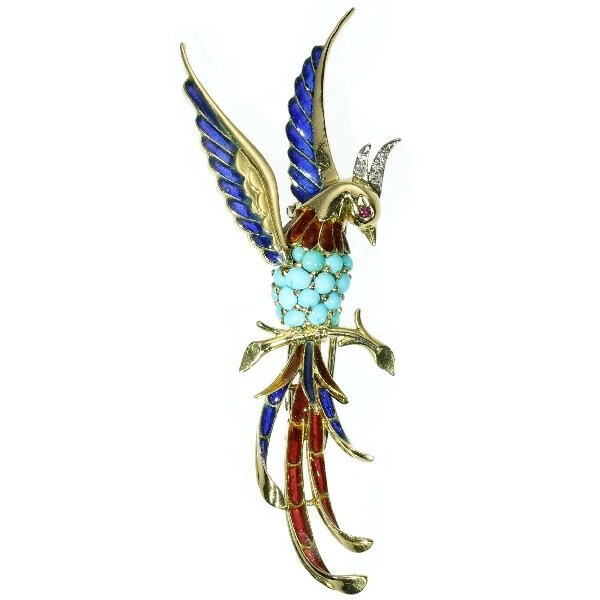 This bird of paradise arose as a French Fifties brooch in 18K yellow gold scintillating with vibrant gemstones and plique-à-jour enamel. By flapping its wings up while sitting on a branch, the translucent blue and red in the feathers of the wings, the tail and the neck flare vibrantly next to the five single brilliant cut diamonds in its crest, the 16 cabochon cut turquoises in its body and its ruby eye. Hurry to catch this bird before it flies off to paradise without you. Style specifics: This type of jewelry is very specific for the fifties of the twenthieth century. All sorts of animals were used as source of inspiration for the goldsmiths. Made in gold and decorated with enamel and precious stones, the result of their labour most of the times well-made, clever and cute. Extra information: Besides the French hallmarks we also found a re-mark struck in the Netherlands, meaning somewhere in its life this brooch has been imported into the Netherlands. Diamonds: Five single brilliant cut diamonds (also called 8/8) with a total estimated weight of approx. 0.05 crt. Total diamond weight: approx. 0.05 crt. Birthstones: Diamond is the birthstone (or month stone) for April Turquoise for December, and ruby for July.